Combine all ingredients and whip for 6-7 minutes in an electric mixer on medium/high. Spoon into jars. That’s it. You’re done! Easy, right? 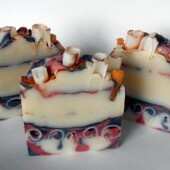 Who knew something great could come out of an afternoon of experimentation in the soap lab? I’ve been using it on my elbows and feet and totally love it! Previous Post: Is There a More Charming Pastry? No I did not get my Non-Organic Shea Butter from Bramble Berry. The Non-Organic Shea Butter I have works wonderful in this recipe. It’s the Organic one that doesn’t work. This Organic one I have is I believe just to soft and oily. So I think adding the Cocoa Butter should do the trick. Wow I would love to be able to add Cocoa Butter to the recipe! I love Cocoa Butter and it’s smell. I bet your right! I think my Organic Shea Butter won’t work because it’s too soft. It’s not in rocks like my my non-organic one. I really hope this helps because I really don’t want to have to switch to the non-organic shea butter. I LOVE the smell of the Organic one so much more! I can’t wait to try this, and thanks so much for writing back so quickly! Are you purchasing your non-organic Shea Butter from Bramble Berry? 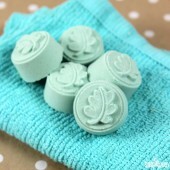 When we sell it, it is a little hard but it should start to melt on contact with the skin. Ok, I just found out that it wasn’t because I had too little in the pot. It’s because my Organic Shea Butter won’t whip! When I added more before it worked because I added my other non-organic Shea butter to it. I just made a large batch with my Organic Shea Butter and Coconut oil, and it won’t whip. It’s runny. Any ideas? I’m so sorry to hear that! I know how super frustrating it can be when your recipe doesn’t turn out the way you are expecting. If you want to thicken it up, you can either add more of your non-organic shea butter to it or if you have any cocoa butter, I’d try melting 1 teaspoon per ounce of your recipe and adding it in. The Cocoa Butter should help thicken it up a bit. I hope this helps! Never mind!! Ha ha ha…Its working now! Hmmmmmm I wish I could delete my stupid question now.Ha ha…I really shouldn’t try making lotion at 1:00 in the morning! I realize I said I cut the recipe in half. I meant to say I cut the recipe in half about 5 times! !.lol….Anyways I added another 1/4 cup shea, and half of a 1/4 cup Coconut oil, and it worked! Just needed more in the bowl is all. Thanks so much for sharing this Awesome recipe!! When you were using the extra virgin coconut oil, was it solid at room temperature or liquid? If you are using a liquid coconut oil, the recipe might not whip up as much as you are wanting it too. I’d try using a coconut oil that has a melt point of 76 degrees. Made this earlier tonight. Because it was in the upper 60s in my house, I had to whip it a lot longer, 30-35 minutes or so, to make sure the shea, coconut and FO were incorporated. I think I did 15.4oz shea, 5.3oz coconut. I got 18 – 2oz jars and 2 – 8oz jar – worked out the small jars held 0.8oz by weight each and the 8oz jar held 3oz by weight each. I also added a scant tablespoon of sifted cornstarch to it and it cut down on the greasy feeling but still so soft. Glad I found it so I had something to do with my shea. That sounds fabulous, Vanessa! What fragrance oil did you end up choosing for this project? You can also use Tapioca Starch Powder to help cut down on that greasy feeling. Hi !!!! Love the recipe super easy but how can I avoid the greasy feeling? 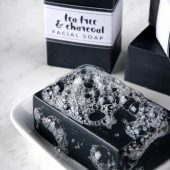 This may be a silly question, but is this a soap that has to be washed off after use or is it a lotion like product that you leave on your hands? The whipped Shea butter is a leave-on lotion-type product that is meant to stay on the skin. It’s very nourishing and I absolutely adore the batch that I made, and I use it all the time! I’ve recently placed my 1st Bramble Berry order to try my hand at lotions. 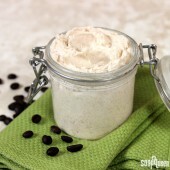 This whipped shea butter recipe was my 1st recipe to try! I can’t say enough of how much I loved it and how easy it was. I’ve made it twice now! I’ve noticed that sometimes I have small chunks of Shea in my jars. My thoughts were to just whip it a little longer next time (I cut into chunks and mixed 6-7 mins), but is it possible to over whip? The recipe states to whip on medium high. To be exact.. what number is medium high to you on the KA? I can’t wait for more lotion/cream recipes to be posted and would also like to learn how to make a liquid lip gloss, are any coming anytime soon? Thank you so much for your order, I am so glad to hear you are enjoying this recipe, it is one of my favorites! If you noticed chunks of she butter in your jars you can whip it up a little longer next time. 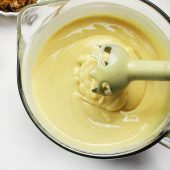 When I whip mine up, I used a hand mixer on 2-3 and whipped for about 8 minutes until there were no more chunks in my mixture, then I scooped it in my jars. And, we’ve never noticed that you can over-whip it, but the more you do whip it, the more air will be in your final product. Have you seen our newest lip recipe? It’s a Vanilla Latte Lip Balm and it is just so yummy! I’m now excited to give the new lip balm recipe a try (It will be my 1st lip balm!). Will need to put an order together soon! Hi…i wanted to add some cornstarch in what i made, though Tapioca Powder would be awesome , it’s not just available here 🙁 …do i still need to melt everything or just use a mixer for it? thanks! You can add either add Tapioca Starch, Cornstarch, or Arrowroot Powder to this recipe to help cut down on the any greasy textures. And, we don’t suggest melting anything down as the Shea Butter will start to melt on touch, and if you melt it, it can become grainy. 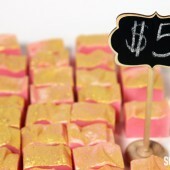 Can sparkle/shimmer be added to this recipe? Will a light sparkle be left visible on the skin. What would the ingredient label look like for this particular recipe, if used exactly as the one posted here? Butyrospermum Parkii Fruit, Cocos Nucifera and Fragrance. Quick question…I noticed some gray stuff in one of my testers. I have not noticed it in any of it in my final products. Any idea of what it is? Can it be from people dipping their fingers in it? I was a little grossed out, but relieved that it wasn’t in the other jars. If it is one of your testers it might be from people dipping their hands in it (you never know what they have one their hands), so I wouldn’t be too worried. Since this product doesn’t have any water in it, there is no need for a preservative. But I would tell your customers to make sure they are using it while their hands are dry to prevent anything from getting in it if you are worried. I am just beginning to try to make lotions. This recipe looked like a nice place to start & economical for a beginner? I wanted to find out if color & or sparkle can be added to this. If so, will light sparkle be left visible on the skin? 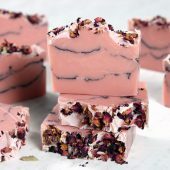 Dear bramble ladies and everyone else, I just spent the last 2 hours reading this complete post and not only do I find this recipe to be delicious (can’t wait to try it) but I have LEARNED SO MUCH from all the comments!! This is priceless information, thank you!! I was able to get my hands on some cupuazu butter, sesame oil, buriti oil, and cocoa butter, do you have a good idea on how could/should I combine these for a similar whipped butter? Gorgeous recipe, looks yammi. As you have another recipe as Whipped avocado butter. 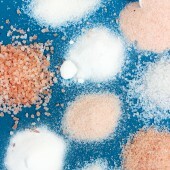 In that you use a lot of things as Tapioca Powder and Green tea extract. Why does it different? In this whipped she butter I do not need to use Tapioca Powder? It is only because of the avocado butter? Secondly I found near my place Rosemary Extract and Green Tea extract, but there is more possiblity. 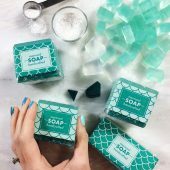 Which is good for the soaps and lotions? Rosemary infused oil (“extract”), Rosemary alcoholic extract, or Rosemary water infused extract? 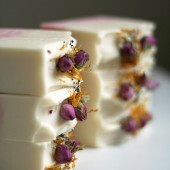 You can use infusions, extracts or other ingredients in your soaps, it really is up to you what you want to add. Infusions are great to add to your recipes because they can provide color and great skin-loving benefits as well. Can you please clarify, what are the benefits of using double wall jars? Two things, (1) temperature control. The double walled jars will stay more temperature-neutral inside the jar. (2) perception of value – the double walled jars look bigger on the outside so the perception that customers are getting more product is there. Many high end lines do this. Is there any way to prevent the final product from melting in extreme heat? Hi I’m new to this… If I wanted to add grape seed extract for the antioxidant properties, how much would I add? Thanks so much! I’m excited to try this out. I just whipped (heh) this up and I am in love. I cut the recipe in half, added 2 tsp of Tapioca Powder, a bit of carrot oil, a bit of vit E, calendula extract, and a teensy bit of amber fragrance. I really like it, but a dab will definitely do you. If it stays too greasy, I will probably re-whip it with a tad more Tapioca Powder. Unrefined Shea and coconut oil 76. Whipped but slightly grainy. Once you start to rub the graininess rubs in. Not a big deal. Whipped but made less volume also slightly grainy. Wow! Thanks for testing it three different ways. It’s great to know that all of them will work. Which one did you find to be your favorite? Hi, really nice recipe! Do you have any suggestions on how to make something that isn’t as hard as a body butter and isn’t as liquidy as a lotion… perhaps a body mousse? Any suggestions? Thank you! Can you post a tutorial or recipe on making a body butter using cocoa butter? We’ve tried to make body butter with just cocoa butter (a lot) and it just gets too hard. As a small portion, like 10-15%, it’s a great body butter addition but as a whipped body butter on its own, it doesn’t do a great job. Could I use a stick blender for this recipe? I think this recipe will be really fun to make. I don’t know if a stick blender would be powerful enough to blend this recipe, but if you have a hand mixer that could work for this recipe, you just would need to mix it a bit longer then you would with the stand mixer. I’ve used a stick blender for my whipped butters in the past and the result is much less fluffy. It tends to have more of a cream consistency as air isn’t really whipped into the mixture. This can be useful, however, during the summer months (especially if you plan to sell) as coconut oil has a low melting temp. and can alter the texture if it liquifies. So, to properly label this would the ingredients be listed like this? Ingredients: Unrefined Shea Butter, Coconut Oil, Honeydew fragrance oil. I wish there was an app that I could simply enter my ingredients and their measurements and it spit out my list of ingredients properly. It would be a great way to double check myself. Butyrospermum Parkii (Shea Butter) Fruit, Cocos Nucifera (Coconut Oil), Honeydew Fragrance Oil. What would be the proper storage for the body butter? I have found a few articles online stating the refridgerator is the best. will the consistency and the results still turn out the same if i use some Unrefined Shea Butter that has already been whipped? i have a few ounces left over from something else and don’t really want to waste it. it has not be scented or anything, just plain ol’ Unrefined Whipped Shea Butter. also, does it matter if you add the F.O. to the mixture before you whip it or after you whip it? Using refined versus unrefined shea butter shouldn’t make a difference in this recipe, so your whipped shea butter should work for you! We normally suggest adding all the ingredients a the same time as it will help them all mix in the right way, but if you have already whipped your shea butter, try adding the fragrance oil in and whipping your shea butter a little longer (about 10 minutes). do i need to alter the recipe some in regards to the whipped shea being a larger amount volume wise, but not density wise? the ratio used in the recipe was for shea butter in it’s SOLID state and not whipped. do i need to figure out a new ratio for it since it is already whipped? 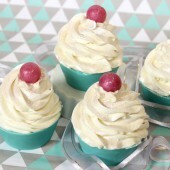 I’m getting ready to make this very shortly and wondering — I’ve seen it mentioned that the coconut oil and the shea butter are melted, the shea butter is not melted but the coconut is and that they are both melted and then whipped. I just want to make sure I have this all correct to ensure the best end result possible. My daughter has super dry skin and her dr suggested today that we use Shea butter (and other commercially made lotions that are alot more expensive to make – considering I have this all on hand – and I don’t want to put all those chemicals on my daughter’s body) so of course I came home and came right to your site cos you always have the best “recipes” here. Don’t melt either of them. We didn’t in the original recipe and that’s what I like the best. Make sure you’re using solid-at-room temperature Coconut Oil and not Fractionated Coconut Oil which is liquid at room temperature. I hope it helps your daughter’s skin. Love the recipe and have been reading the comments in search of answers to my questions. 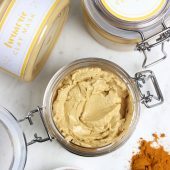 I am new to making body butter and I am “playing” with desire to create one – two butters to sell. 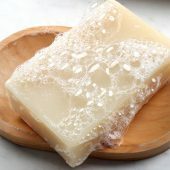 So I have tried working with shea butter using melting and cooling methods and this recipe here on SOAP Queen. I like this recipe because the butter stays fluffy rather than the butters that are melted. The only thing is that I may need to whip more because I noticed that I had a bit more “grainyness” – is this how the BUTTER is or did I miss a step? HELP – any ideas are greatly appreciated! I’d try it again with fresh butter this time, but don’t melt it. Normally, the graininess happens when the butter has melted and then sets up again (it can also happen if you live in an area that is quite warm). I made this…. WOW! Amazing… I added Brown sugar because I thought it a teeny bit too greasy – but – Wow. I gave it to two people who loved it.. told me they needed no lotion after the shower! You can also add Tapioca Powder to the recipe if you find it too greasy. We have added it to our other whipped body butters and have found it to work perfectly against that greasy feeling. Can I add emulsifying wax to this to make it thicker? We find it to be a perfect thickness for us, but if you were looking to thicken up this recipe, we would suggest using less coconut oil (as that is what helps this body butter be softer). You wouldn’t want to use an emulsifying wax because there is no water in this recipe and you don’t need to mix (emulsify) them together. It does! Thank you. I’ll try it with less coconut oil. I’m looking for more of a thick body butter consistency, so I think less coconut oil should work well. Hi Becky! I know this is probably off subject but since we’re here I’ll ask anyway. Using emulsifyers always means using preservatives because of the water? or is an emulsifyer already acting as a preservative? Thank you so much! I just made this and I like it but is there anything you can suggest I can add to it to make it less greasy? It dose not bother me so much but my friend who tried this wanted to know if I can make it so. If you are feeling it is too greasy, you can use Tapioca Powder, which helps to cut down on that feeling. I would recommend starting out with 1 Tablespoons of Tapioca Powder per pound of oils and add it and whip whip whip it in. I used my hand mixer and whipped it for nearly 20 minutes on medium high and high and its still really liquidy. I’m hoping if it sits maybe it will thicken up. Any suggestions on how to get it thicker and more aerated like yours?? The key is the stand mixer – it really helps to whip a lot of air into the product AND cools it quickly (much more quickly than a hand mixer). The cooler your product gets, the more stiff it will get and the more the air stays suspended. First off, I love all of your sites! I made my first soap loaf last night and it was so fun! I’m officially addicted. Anyhow, I want to try the shea butter and the avacado butter recipes this weekend but need to buy an electric mixer. If you don’t mind sharing, what mixer do you use? I need something that will last since this is for my new business. 🙂 Thank you, much appreciated! Hi Alison! 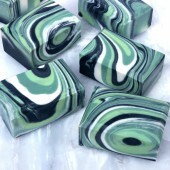 Congrats on your first soap loaf and welcome to the soaping world, you’ll never get enough of it! 🙂 We adore our mixer, it is a KitchenAid Artisan Mixer, 325 watts. Good luck in your new business! Question I made the this recipe and gave it out to some of my friends to try and I gave them all 8oz jars because that is all that i had on hand. How much to charge is what I need to know for a 8oz jar. I don’t want to be to high and also to low. We don’t want to tell you what to charge for your product, but we can give you some general guidelines on how to price them. Always include the price of the ingredients and any tools that use, and don’t forget to pay yourself! i was wondering since its pistachio butter and not shea? will there be a huge difference in my end product and also in the whipping time? i will be trying this by an electric hand mixer…is there an Average mix time you have noticed? also…how many does this recipe yield? Pistachio Butter would make an excellent substitution to the Shea Butter and will not make a huge difference in your end product or whipping time. Everyone’s mix time is a bit different, but if you are going to be using an electric hand mixer, it might take a little while longer. I would say at least 10 minutes, or until it gets to be the consistency you are wanting! can you add Tapioca Powder and how much would you add? Hi Tabitha! You can start out with 1 teaspoon of Tapioca Powder per pound of butter, in our last batch we used it in we added 5 teaspoons in a 14 ounce batch and it rocked! Ohhh myyy heaven!!!! This is perfect! I used a brown sugar/fig fragrance…I feel like I won the lotto…lol..it’s the little things, right?! That sounds divine Tonya! We are so happy to hear that you love this recipe so much, it is one of our favorites (and by the amount of comments, many others favorite as well)! Hi! I have been reading all your comments and posts. Can the vanilla select fragrance oil be used in the body butter? In one post I thought it said to use EOs only then in one I saw vanilla fragrance oil. I would love to make this with a vanilla select. Thanks! .05% for the fragrance oil – just a little bit. How much Cinnamon EO would you use in this recipe? I am asking because I know its really strong and that is what I have on hand to make it smell good and its one of my favorite scents. Cinnamon EO is a skin irritant and current regulations have it at a suggested .05% usage rate which means, literally, less than 1/10th of an ounce for pound of base. Who do you buy you shea from? Sometimes the shea heats up in transit and that can make it a little grainy. Let us know and we are happy to help you troubleshoot! Hey Becky! I realized that both times I made these batches it was 68 degrees in my house(I live in California and it’s already so hot here). I turned off my air conditioner, ran an errand and when I came back, I had NO clumps in my mixture! Thank you for your quick reply. I’m glad I figured out it was the temperature! Love this recipe! 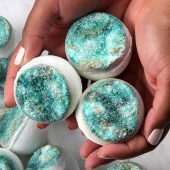 I made the Shea scented in Vanilla Fig and then made another batch up using Mango Butter, scented it in Mango-Peach and added just a hint of peachy colored mica. Beautiful! What I was wondering is how this will hold up in the summer months. Will it melt at outdoor craft fairs and/or during shipping? I’d really like to be able to continue selling this year round. Or is there another recipe that you would suggest for summer months instead of a ‘butter’? Hi Cassie! It really depends on the heat, but the butter will melt anywhere above 80 degrees. Many people don’t ship whipped body butters during the summer because of that. 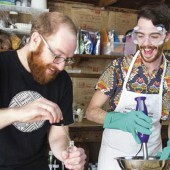 What you can do is make a traditional lotion with water, oils and emulsifying wax. Here is a simple and easy kit to get you started. You are going to LOVE this recipe, it is so simple and easy and literally only takes about 10 minutes to do. 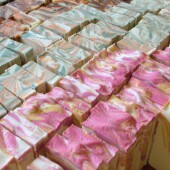 Question… When I made mine I used Raw Shea so I had to melt and cool while whipping. It came out whipped and lovely like your picture above but after putting it into the jar it got a little solid, like somewhat soft butter would be and not so fluffy. Should I mix it more? Is it possible to over mix? I’m using a hand blender. Thanks!!! Going to try without heating it tomorrow and see how it comes out! I have coconut oil that says can be heated up to 280 degrees F. I don’t see anywhere on there that it says it melts at 72 degrees. Are you referring to C or F? Its unrefined Organic Virgin Coconut Oil from Spectrum, is this okay? Quick question.. So I would melt my butters first right? Because The butters I have are hard… Sorry I’m an amateur. I think it’s awesome that you went to Saudi!! I dream of going there one day! 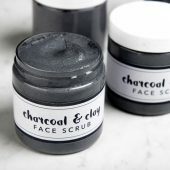 I would love a post on how your experience was there..
Also- can this be used on the face?? In this recipe, you are going to want to melt your coconut oil fully before you start to mix the rest of your ingredients. And it is totally okay to use it on your face, but it might feel super heavy on your skin. I thought coconut oil was supposed to stay hard, no? Just a quick question about adding honey to this recipe. Honey is not oil so adding Vitamin E oil would help preserve this Whipped Shea Butter better/longer? I have not tried this recipe yet and have been researching for whipped shea butter recipes on youtube, which mostly requires the heating and cooling method. Since this recipe has no water, you don’t actually need a preservative. Vitamin E would be great to add to it since it has some wonderful skin-loving antioxidants in it, but it isn’t actually a preservative. Hi I used honey and it was way too sticky. I love shea butter and this recipie, but would like to color it. What can I use to color shea butter or am I stuck with the white? Thanks! I am so glad that you love this recipe, we love it too! You can absolutely color the shea butter. 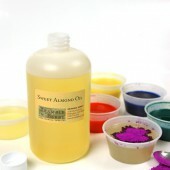 All you need is oil-soluble colorants! We really love using the micas, as they do not clump up in the shea butter! I am off to Kohls with my 30% coupon and getting a Kitchen Aid right now! I can’t wait to try this…I love body butter! Thanks to all the comments and everyones success on this recipe gives me great hope on this one! Thanks Anne-Marie! Anne – Marie you are Awesome. I love this recipe, I love how it is quickly nicely absorbed by my body. My family loves this, all our bodies are loving it, thank you. One question though. Is it meant to remain in the “just whipped” consistency (as in the picture above? After whipping, my got slightly softer, and I followed the recipe as is. I am wondering if I maybe added too much EO. All in all I added about 60 drops of lavender, Orange and Cinnamon oils. It’s still usable but I would like it to be in the “just whipped consistency”. How much EO would you suggest? Your essential oil usage rate doesn’t sound like too much at all. Are you in a warm environment? It kind of sounds like your mixture may have gotten a little warm? Or maybe over mixed? How long did you whip your recipe? Soap Queen you rock. Thank you for replying so soon. Yes, later that evening I made a smaller batch and kept it in a slightly cooler area and it maintained the correct consistency. So it was definately the temperature. Although Autumn has started, we are still having lovely sunny days down here in Cape Town, South Africa. Oh, I made a Cocoa Butter, Olive oil, Avocado oil and Jojoba oil version, 60/40 hard, soft oils and it came out perfectly. I love it. It takes slightly longer to be absorberd into my skin but its perfect. Will be great for those rainy winter days we have here in the Cape. So glad this worked out for you! Sometimes you need to play around with the recipe until you find the right amounts that work for you. Hi!…I’ve been making this for about 3 weeks. The first time I tried it with refined/deodorized (white) shea butter.Worked great. Not grainy. A little oily, but great for bedtime. Then I tried it with raw/unrefined shea butter (yellowish/gray). I saw a post that said you should be able to use raw shea butter with similar results. I switched to raw shea butter for the more natural properties- more vitamins/etc. The consistency is not the same. It doesn’t have the same “whipped” feel and it is grainy. I am not melting the shea butter or coconut oil. I’ve tried it room temp (for both), and then tried it with a slight softening in the microwave (less than 30 sec). I’ve altered my whipping, whipping less and whipping more (anywhere from 10-20 minutes).Any ideas on how to make the raw shea butter have the more whipped feel and how to make the graininess go away? I LOVE the recipe! Thanks! I’d ask your vendor for the raw shea butter but that’s one of the reasons that Bramble Berry doesn’t carry raw shea butter. We just haven’t found one that is awesome for us to craft with. The refined does have a smoother consistency. That said, what’s happening is that the shea butter has a variety of fatty acid chain components. Some of those are harder than others. When you melt or break up those chains, they sometimes come back together in a strange way. Thank you so much for sharing this recipe. I was wondering if an essential “oil” could replace the fragrance oil or would that be considered adding water, causing mold growth issues? Thanks again. I am so excited to try this recipe. Essential oils should be fine for use in place of the fragrance oils, as long as the essential oils are pure. They shouldn’t cause any mold issues. Thank you so much for this recipe and all the information via the comments. I am very excited to make it this week. Just wanted to share something with you. If you want to make a smaller batch (I cut the recipe in 4), also think of suitable cup/bowl. I had mine quite big so ended up chasing the pieces of shea around the walls, not an easy job haha..
Good feedback – that makes total sense =) A smaller amount would be tough to work with! Could I substitute arrowroot by orris root powder in case this will come out too oily to my liking? You can try Orris Root but I’m I like Arrowroot or Tapioca Powder from Bramble Berry. Well, I was just reading about 92 degree coconut, which is hydrogenated to make it more heat stable. It isn’t good for the inside of your body, so it probably isn’t good for the outside either. I’ll be sticking to the 76 degree, and keeping it out of my bathroom :-). I followed it to a T- I didn’t melt the coconut oil at all (not sure if you guys did or didn’t). I used an EO Blend of pure oils in one batch and a pretty solid vanilla absolute in the other and had the same result with both batches. The only other thing I can think is that I had the ones I used in my bathroom- Oh no! I bet it was the coconut oil- 76 degree oil and the heat from my shower! Maybe I’ll try the 92 (or is it 96? )degree, it should still melt on skin contact, but I wonder if it would still be as whippy? Or I could just not keep it in the bathroom, but I want to sell it, so I need to get that worked out. Thanks!! Thanks for the update. That’s probably why it was separating! This is very interesting. 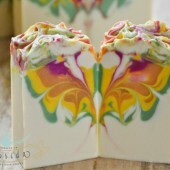 We had the original whipped shea butter in our soap lab for almost a year and it looked great. What fragrance oil did you use and did you follow the recipe exactly? Any tricks for getting the shea butter off the blender? You can release the lock, barely lift the blender and then turn the blender on and keep speeding it up as all the butter starts to flick off the blender =) Don’t lift the blender too high – or else all the butter will go ALL over the walls (yup, been there, done that!). Any tricks to get the shea butter off the blender? What else can I use instead of the Tapioca Powder and how much? Tapioca Powder is out of stock and I need something to use this week. Yes, you can use this on your hair. Focus on the ends rather than near the scalp. would the end product consistency be the same? Should I cool the liquid jojoba to solid and then mix? would I use measuring cup amount since I dont have a scale? Where is the best place to get a scale? 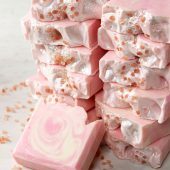 Is there Organic shea butter bricks avaiable? Thank you! End consistency will be significantly softer – because Coconut Oil + Shea Butter are both solid on solid. Cooling the jojoba oil won’t change anything for the final product. Can you cobine butters for this? 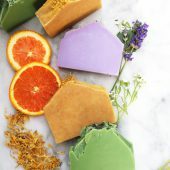 Combine like butters like Mango and Shea is definitely possible – but they need to be like to like in terms of consistency so adding cocoa butter, for example would not work. Hi Anne-Marie, I was wondering if I could use a different oil for mixing? Everyone doesn’t like the smell of coconut, so would olive oil or almond oil work with this recipe?? Since coconut oil is solid at room temperature, if you used a liquid oil, the recipe will have a different (softer) consistency. It will still work – just have a different consistency. Hello Anne-Marie-I have another question for you. I have a really hard time finding a facial moisturizer for my sensitive skin that really helps my aging problem. I have always ordered organic or no paraben items. They are very expensive. Thought I could save money so I ordered a Natural Multi-base Lotion made from distilled water, Aloe Vera, Sunflower Oil, Jojoba Oil, Meadowfoam Oil, stearic Acid, Soya Oil, Cetyl Alcohol, Emulsifying Wax, Veg. Glycerin, Palmitic Acid, Tocopherol, Potassium Sorbate, Vit. C, Citric acid and Rosemary oil. It is extremely thick and all I am supposed to do is add enough warm distilled water to it until it reaches the consistency that I like. My question: do I need to add some kind of preservative to this since I have to add the distilled water. In reading the above write-ins and your replies it seems that once water is entered into a product it needs a preservative. I ordered one pound of this product and it is supposed to give me 2-3 pounds of lotion when the water is added. I would like it to last not spoil. Should I mix a little at a time? What is your opinion? Thanks so much for all you do for us out here TRY IT OURSELVES LAND!!!! First of all, have you tried Tanaka Massage yet? YouTube search for it. I have seen some pretty interesting before and after pictures and you can do it with just straight vegetable oils. Second, of course I would 100% recommend talking to your vendor but I would assume that they have not preserved for your additional water because if they had, the original MultiBase would probably be over-preserved for the original amount which seems like an unsafe idea…. Just talking out loud here. Finally, I know that MultiBase and in every vendor I’ve ever seen selling it, they’re using Germall Plus (a paraben based preservative). It’s usually listed right after the Citric Acid so I wonder if it was accidentally missed on your vendor’s website? So, while I hesitate to mention it, I strongly suspect that the product is preserved. If it wasn’t, it wouldn’t NOT grow mold over time with those ingredients. Hello everyone. Wow! I have learned quite a bit from reading what is on here alone. I am so glad I stumbled across this site two months ago. In terms of the recipe, I made something similar. No, I didn’t whip it so don’t freak out as to what you are about to read. I am going to try the “whipped” version. I want to add a liquid oil just to see what the consistency will be – not hard as a rock but spreadable. Tell me what you think..thank you! I’m sure your balm is LOVELY without whipping – that’s more of a balm or a lotion bar – but a whipped butter is definitely a different animal (even uses the same ingredients – just a different process). Keep me posted when you try it. I’d love to hear what you think of it. I just stumbled onto this thread last night and feel like a kid at Christmas! Thank you so much for this fab recipe. I actually mixed in some salts and had a question. While the body butter doesn’t require preservatives because there isn’t any water in the product, should I add a preservative to a body scrub because of the moist environment? Thanks again, can’t wait to dive into your site and start reading! Body butters do not require preservative if there is no water. You are correct. Body Scrubs are another story. Many people do add preservatives at 1% because people using the scrubs are dipping their watery hands back into the scrub, potentially introducing bacteria in that small amount of water, back into the scrub. Phenonip at .5% to 1% would be a good choice if you’re going to add a preservative. Made this today and absolutely love it. I’m very new to all this fun and am only making it for personal use and gifts. I’m curious about the sterilizing cautions mentioned up above. My mixing bowl was clean, but not sterilized. Will that effect the shelf-life of the product? 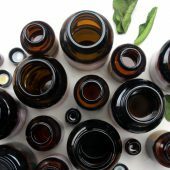 Thank you for the tip about plastic taking on the essential oils. I am allergic to many fragrance oils so I bought some lovely EO’s from Otion, but I didn’t know they could seep into my plastic mixing bowls! Looks like I’ll be picking up some extra bowls! Thank you for your site and for all the education you offer. This has been great fun to discover. Yes, get some extra bowls just to be on the safe side. I’d hate for your food to taste like fragrance or essential oil! A.M. I am a little confused on the ratio for adding Tapioca Powder. 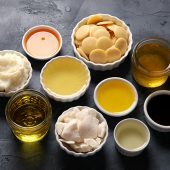 In one post above you recommend the following: “I would recommend 2 Tablespoons per pound of oils and add it and whip whip whip it in” and then farther down you recommended the following: “1 tsp to 1 Tbs per 16 oz. of product”. Neither of those oils have any scent – they are actual food grade cooking oils so they will smell natural and oily but no smell. You could use those (Almond and Apricot) for massage oil or lip balm or lotion bars (if you had any beeswax). Dry Flo was discontinued to do low sales from the manufacturer but we have located a completely ideal replacement from a brand new manufacturer and we are just waiting to confirm pricing since it’s a new product for them. I have refined shea butter, almond oil and apricot kernal oil. Just found your website and am thrilled to have found your recipe. Our garden club girls all bought the same ingredients to make a shea butter batch but we not sure just how to go about it until now. My question, and I know you have discussed it some, is about the oil. We do not have the coconut oil and want to use the almond or apricot oil. Other than the consistency, is there anything else we should know about the difference in the oils before we waste our small amount of ingredients. We each only have about 1 and one-half pounds. Thank you so much Anne-Marie. You are fantastic! Make sure to whip it up – that’s the key – the whipping (without melting). Ann Marie I love this recipe! I have a few questions and really hope that you will be able to answer them. Aside from the shea butter, what other butters can be used? And what other sorts of things can be added to the recipe? Different oils or anything like that? I have been making it and just love it. But I want to start playing it up a bit and see if I could use different butters and different oils? 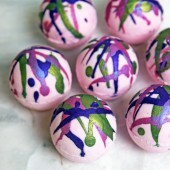 Also was wondering if regular old liquid soap dye or a few drops food coloring could be used. 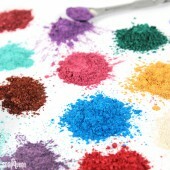 I have been using mica pigments but wish to get a bold color. You could use any other butter with the same consistency of Shea Butter so Mango Butter for example, would work great but Cocoa Butter would not (too hard and brittle). If you do liquid oils instead of Coconut Oil (solid at room temperature) the butter can whip and be lovely BUT it will be softer and not as solid in the in jars. Hi. 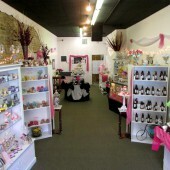 I’m new to this website and new to making my own hair & body products. I don’t know anything about all the comments that I have read. Measurements, percentages, etc. I’m dumb struck! Anyway, I still tried and made a batch. It came out nice and creamy….and greasy. I let it sit overnight, woke up the next morning to my daughter using it. She used it on her hair and arms asking no questions. I asked her how was it? and she said “its cool” and left for work. After she left, I looked in the jar and it turned hard! however it wasn’t as greasy/oily as the night before. I gently “scratched” some off and rubbed it in my hands. It melted very nicely and oily. I really really want that fluffiness…..even after it sits over night. Can I dump this batch back into my stand mixer (yes I have a kitchen Aid…2 yrs now)and fluff it up again? will it fluff again? So both the coconut oil and shea butter should not be heated ?….Just add “as is” and whip ? You are correct – just add and whip – as is. Does the coconut oil need to be melted before mixing it? Or is it just added as is? I have read through the comments but there are soo many!! And they are running together lol. Can I use 92 degree Coconut oil insted of 76 degree? The product won’t melt as easily on your skin with a higher degree Coconut oil. I just mad a small batch of this yesterday and I love it! I too have done the melt, cool and whip routine and the end product always felt greasy. For some reason this recipe doesn’t feel greasy. I put some on my hands last night and they felt soft this morning. 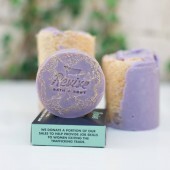 I just gave some to my tester to see what she thinks! Thank you so much for sharing this. Our Bramble Berry candle fragrance oils are NOT skin safe so be sure to check with the vendor and make sure that it’s 100% skin safe. I plan on trying this recipe for Christmas presents. I have a few questions. First of all, is the Cranberry Fig fragrance oil very sweet smelling? And Secondly, everywhere I look, including Bramble Berry, Tapioca Powder is out of stock. 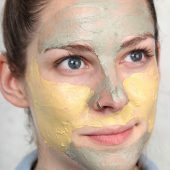 What do you suggest I use instead to make my body butter less greasy? Cranberry Fig is a tart fruit fragrance so yes, it does smell sweet but not like a dessert sweet – more of a fruity sweet. You can use cornstarch for your body butter but make sure to sift it first. How much cornstarch do we use? Go with Cornstarch but sift it for sure! Don’t want any little lumps. 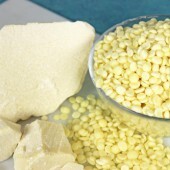 We are hoping to have Tapioca Powder back in stock soon and are in daily communication with the vendor. Thank you Anne-Marie for this incredible recipe. I have a version of this I make that I have Apricot Kernel Oil and also Cocoa Butter. It comes out really nice. The natural oils absorb so quickly that the greasiness goes away very quick. 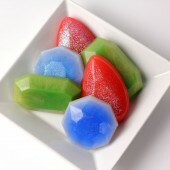 Can you use food coloring in this recipe? Is the glass bowl necessary?? Can you share which model you have?? Now that I have looked at the many different models. I am going to get one that actually looks just like yours that comes with a glass bowl and they are having a special offer which will get me an additional glass bowl for free. 🙂 I am very excited. I do think that working with essential oils it is probably better to use glass rather than metal. Who knows if that theory is correct or not. 🙂 LOl Thank you for all your help. I am in the market for a stand mixer and that picture of your Kitchen Aide is great! I just burned out my 2nd hand mixer. LOL Have you been happy with it and which model is it?? I love love love love love it AND we are crazy busy with it. I think we use it more than your average crafter. The clear bowl is awesome too. I would recommend the extra $$$ to get the clear bowl. This is a really fabulous recipe!! I don’t like the feel of normal thick body butters on my skin so this is perfect for me. I made a mixture, a while ago of just coconut oil (2 parts) and olive oil (1 part)which has the same ‘melt-in’ feel to it but which, unfortunately, here in South Africa, melts to a liquid! I have to keep it in the fridge. My Shea Butter (unrefined) was grainy to start off with so I melted it down in a pot over some boiling water and let it re-set. It whipped up beautifully – looked just like meringue (I was so excited by the texture and feel of it)- but I found that overnight it went a bit hard. Would this be because I melted the Shea Butter? Also, I only use pure essential oils and was wondering what the correct quantity would be for a batch this size? I am so pleased to have found your site. 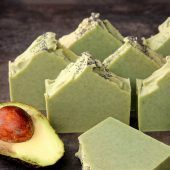 I also make cold process soaps and other 100% natural body products as well as soy wax candles which I sell at some local markets here in Cape Town. I haven’t had time yet to go through everything you have here but I am sure there will be plenty of interesting and helpful articles. I made a very small test batch and it is coming out VERY oily. i used 1.75 oz of UNrefined Shea Butter (solid yet soft @ room temperature), 0.6 oz of Organic Extra Virgin Coconut Oil (completely melted), and 0.75 mL of fragrance oil. Using a hand held eletric mixer, I whipped for about 5 minutes and tested it out. It was oily. I added 0.5 teaspoons of Arrowroot Powder and also another mL of FO (trying to get rid of the nutty/smokey scent of the SB)whipped some more for about 10 mins. It was still very oily so I ended up adding in an ADDITIONAL teaspoon of both the FO and the Arrowroot powder. It is still so oily. In total, I whipped the Shea Butter and Coconut Oil for a little more than 25 mins. Could I have over whipped and that is causing it to be extra greasy? Is the Extra Virgin Coconut Oil solid at room temperature or liquid? You say ‘completely melted’ so I assume solid. 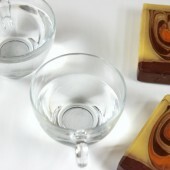 The fragrance oil will keep the product oilier and softer so you don’t want more of that. It’s tough to say why it feels so oily or if it actually feels oilier than the product I made. It is 100% Oils and butters so yes, it’s oily but I don’t think it’s unduly oily …. hm, tough call. You did the right thing with Arrowroot though – good instincts there. Too much whipping will not make it too oily so you didn’t do anything wrong there. I would try traditional Shea Butter and traditional Coconut Oil (so ultra refined and skip the virgin organic) and see if that gets you better results. Thank you for your response, Anne-Marie! The coconut oil I used does melt at 76 degrees. I didn’t have to melt the oil for this mixture because the kitchen was already sunny and warm and the oil melted naturally. Now, based off what you stated about the fragrance oil keeping the product oiler, I’m starting to think that may be the cause here. In total I had about 6.75 mL of FO in this small batch. I left the mixture out overnight completely uncovered and it seems that the nutty smell has faded some. I can now smell a very FAINT hint of the FO I used. I’m gonna try to add another 0.5 teaspoon of the Arrowroot and NO more FO. Definitely keep me posted – I can’t wait to hear how it turns out. I hope that you were able to make it into something you really like. I’ve made it this way, and made it using 2:1 shea:aloe butter or shea:jojoba butter. That makes for a firmer product, and it also works well. Adding 1 T of honey also adds to the humectant value, and doesn’t leave any stickiness. Hm, that’s a great question. Shea Butter is really soft and cocoa butter is hard and brittle. 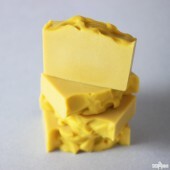 But, maybe you could add 60% liquid oils to the 40% cocoa butter, melt that and then try to whip it as you cooled it. Keep me posted on how it goes AND just try for a very small batch and not a big batch =))) Test small amounts first. I love this recipe, but I also have a lot of Cocoa butter at home. I was hoping for an easy to use whipped lotion with cocoa butter. Do you have any suggestions? Can we add a little natrosorb to help with the greasiness, and scent a little? OR would it seperate? Yes, definitely add any fragrance oil that you prefer. We used Cranberry Fig. If you want to cut the greasy feeling, I would suggest Tapioca Powder (which is a modified tapioca starch). Have fun with the recipe! How much Tapioca Powder do I need to add to this recipe? I get 6 4oz jars and a tester jar out of half of the mixture……. Does anyone else get this same amount? if I wanted to add goat’s milk to this recipe how much would I add and then I would need to add a preservative which one and how much? Thank you can not wait to try this!!!! You can’t add Goatsmilk to this recipe as it will just separate out, eventually. It would need an emulsifier to keep it in the balm. ok thanks for the reply. I will definitely make your recipe but still looking for a cream with goat’s milk , does that need to be more of a regular lotion? If you wanted to make a cream with goatsmilk, you’d want it to be more of a regular lotion and then it would have a shelf life because of the goatsmilk potentially going bad over time. We don’t sell unrefined shea butter but I would imagine that it would work the same in this recipe. Shea butter can get grainy if it’s overheated. Do you think that’s what they were talking about? If I wanted to substitute and use raw unrefined shea butter would the consistency be the same as the refined shea butter? I read on a different blog that it can be a little grainy??? Have you had this problem? Thanks!! Not sure if I over-whipped mine. I measured out half of the amount as stated i.e 7oz Shea and 2.5oz of coconut oil and it filled 6 (whole) jars. The jars are meant to hold 125ml each yet they only held 40g/ml of the whipped body butter. Did I over whip it? I did not do it for more than the 6-7 minutes as stated above but there was LOADS of it in the mixing bowl. Has this happened to anyone else and do you think that this will make it a less moisturising jar? I was hoping to get at least 100ml/g in each jar as it is for selling purposes. I thank you in advance. It will last over a year. Since there’s no water in the product it’s not subject to mold growth. And it stays super whipped and fluffy too! I just made this with the grapefruit lily FO and it came out so NICE! I just love it! I made half a batch to test out, I might jar it up next time and sell at my local farmers market 🙂 Thanks so much Anne Marie!! 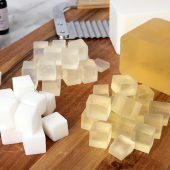 I have been making this fabulous recipe for awhile, but with macadamia nut oil instead of the coconut oil, and it has turned out soft and fluffy. But sometimes it would get lumpy. I think I figured out that I need to slowly add the oil a little at a time and mix thoroughly between additions. I am going to try this today, but thought this might help others trying to do this with oils besides the coconut. Thanks for sharing, Kyle! There are so many wonderful variations that you go do with this type of recipe! Can you use another oil instead of coconut? Like safflower or avocado? Never mind – just saw the answer to my question!! I was scrolling through the comments too. Glad you found your answer! How many oz does it make? How many ounces does this make for a final product? So excited to try it!! I made a shea body butter last night and ended up dumping it all because it was soooo oily. Thank you! 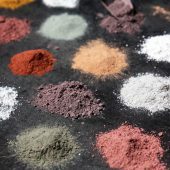 I just ordered some Tapioca Powder and can’t wait to get it! I love everything else about the whipped shea, I scented it with lavender and I’m nuts about it! 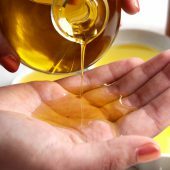 Yes, typicallly adding straight oil to your skin would feel more greasy than a straight lotion (which has water added to it to cut down on the grease feel). 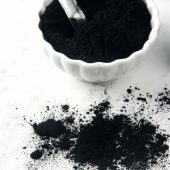 If you’d like a less greasy formula, the product to use is Tapioca Powder (https://www.brambleberry.com/Tapioca-Powder-P3803.aspx) at 1 tsp to 1 Tbs per 16 oz. of product. 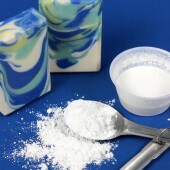 PS – Cornstarch will also work but not as well. It’s clumpy and ‘heavy’ feeling on the skin, in my opinion. I tried this tonight and found it to be more greasy than I expected. Awhile after I rubbed it in, it still seemed shiny and oily. I added a little Polysorbate 80 as someone suggested above, but it didn’t seem to make a huge difference. Does anyone think it might be better once I let it sit overnight? 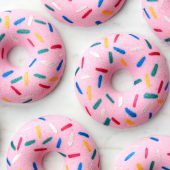 Should I try adding more polysorbate, or try the cornstarch? Thanks! Hello. New to the list, hoping to make some Shea Butter Lotion real soon. 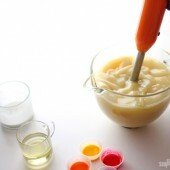 I plan to use our inexpensive hand-held electric mixer, the one we use for mixing cake batters, etc. Does mixing shea butter and fragrances make the beaters unfit to use for food preparation? I can’t imagine it does, as the beaters are stainless steel and to my knowledge there is nothing toxic or harmful in the ingredients, but I’d like to get confirmation from those with some experience. If there is any plastic at all, it will take on the fragrance of the fragrance or essential oil you’re using so definitely keep that in mind. Food that tastes like fragrance oil is not delicious. If you are selling product, yes, buy new equipment. If this is for fun and hobby, disinfect well in between uses. Never mix cold process soap equipment and kitchen equipment as lye can seriously burn or hurt you if accidentally ingested. Love this! Thanks for sharing. I made a 1/10th batch which made only about 1/2c total- perfect test batch. My Shea was cold, so I measured it out along with the Coconut oil in a 2 cup pyrex, then put it in the microwave for 15 seconds, stirred, again 15 seconds. This took the chill off basically, then started whipping with my hand mixer using only 1 whipping blade instead of two. Whipped on med-high for about 4 minutes-that did it! VERY nice! 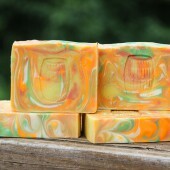 I added Wild Orange Essential Oil and what a lovely scent with the coconut! I added just a 1/8 t Tapioca Powder and it wasn’t quite enough, so I’m off to try another one and play around with my Tapioca Powder some more! just a question my daughter is Allergic to coconut oil can i use grape seed or jojoba oil refined or any other oil. Coconut oil is considered a hard oil because it’s solid at room temperature while GSE and Jojoba are both liquid oils (liquid all the time). Substituting with these oils will definitely change the consistency of the recipe. It may turn out softer and less fluffy but give it a try in a small test batch. I’m sure the end product will still be moisturizing and fabulous! I tryed it as mentioned in Your recipe. It is really fantastic, thank You! How it could be with more coconut oil and less sheabutter? And is the mangobutter soft enaugh to use it instead of shea? I just made my batch of cream and mine is yellow and smells funny. After reading every comment on this recipe I come to learn that the shea butter has to be refined, and you cannot use fractional coconut oil. Well that is what I have in my house, and I used that. I added fragrance to it and it doesnt help at all. I just wished the recipe would of specified what EXACTLY to use and not use. Hope I have better luck next time! Oh I’m sorry Natalie. Fractionated Coconut Oil isn’t ever the same as Coconut Oil and I’ve just never thought anyone would confuse them. I now know better and will definitely amend the recipe. OMG I can’t wait to try this. I made up a combo for my mom a while back with mostly coconut oil. She has CRAZY dry skin (she used to use baby oil on her face! horror). I too saw the “mix until you’re insane” version and then THIS! I should have known to check here first. I pathetically do not have a stand mixer, but I am going to figure this out. Thinking this might go well with our “flip flop package” for smoothing out rough winter knees. So glad to hear the good news – thanks for letting me know! I would try whipping it again as is without melting it. I didn't melt the shea butter in the original recipe (I think this may have been the problem in your recipe). Hi. I just tried my first whipped shea recipe using jojoba oil and the hot to cold (repeat until you've gone insane) method. At first it appeared light and fluffy, now after being in jars for a few days, it has hardened up. Can I fix this or do I need to start all over. I did use raw shea that is quite yellow. What kind did you use above as the color is white and I've never seen that in unprocessed shea. Awesome, thank you! I've been using this today on my poor winter-dry-cracked hands and they are SO soft and smooth and no greasiness, burning, or irritation like with store bought moisturizers. I'm so happy I found this post! Thanks again! Not at all – your shelf life is a minimum of six months if not a full year (I would be shocked if you didn't get a full year when using fresh products). A fridge never hurts but if you can use up/give away/sell within 6 months, everyone should be able to enjoy the product with no problems. I'm in LOVE. I just made this – I cut the batch in half and it made just the amount I wanted. One question, does this need to be refrigerated if it's not used after a certain amount of time? Even this half batch will last me 2 months. Thank you! I hope you give the recipe a try. It really IS fantastic. You don't have to use a fragrance oil but if you're interested you can get them at Bramble Berry https://www.brambleberry.com/Fragrance-Oils-C161.aspx. If you try the recipe with cornstarch just make sure you mix it in really well, but I don't find that you really need it. Looks fantastic, I look forward to trying this. Do I need to use a fragrance? I do not have any (is there a source, you recommend?) if I leave out the fragrance, will I need to make an adjustment? 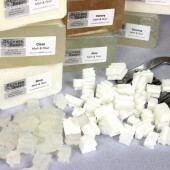 I do not have arrowroot, but I do have cornstarch for cooking…will that work, if I need it? Aw, thanks so much! That is so fantastic that you were able to 'save' the recipe with the Olive Oil. Yay yay yay for moisturized winter skin. I've never used just plain cornstarch – just the modified tapioca powder for cosmetics (Tapioca Powder) but yes, dry up sounds like too much cornstarch. The only way to fix it is to add more oils to dilute the cornstarch. You could whip in an ounce or two of olive oil. It'll make the whole thing softer but also take up some of that cornstarch stickiness. Just whip it in – don't heat anything. Love the recipe but I think I added too much cornstarch and it seems to "dry" up on my skin VERY quickly and feel kinda uncomfortable. Any ideas at all on how to fix this so I don't waste the batch I made? 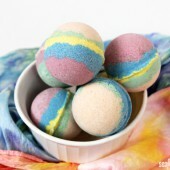 Yes, melting the Shea butter without tempering it can result in crystals that feel like little bumps. That's why in this recipe I don't melt anything – just whip it up until it's soft and fluffy. It could be any of your powder additives clumping as well. You might carefully mix them into the fragrance oil to make sure they are perfectly lump free before adding them to you recipe. Hope this helps! Hope you can help. I made a batch of whipped shea butter and, after a day, little 'pulp-like' nubbins are forming when I rub the butter together in my hands. I used shea butter, mango butter, grapesead oil, jojoba oil, fractionated coconut oil; this was melted and to that I added: silica powder, modified cornstarch and boron nitride. I've experienced 'graininess' before but never these strange, little globules. Betty, Yes, use a stainless steel bowl and definitely make sure it's clean when you start (bleach water or rubbing alcohol are your friend). Mowrah Butter will act a bit differently than the coconut oil (different melt points and consistencies) but the process will work the same. Don't melt either of the products down – just whip them. 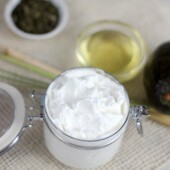 I am wanting to make this whipped shea. 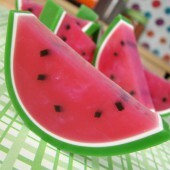 Looks yummy but do you have to use a glass bowl? My kitchenaide has a stainless steel bowl. Also I got some of your Mowrah butter. Can I use that instead of coconut? I've been wanting to do this for years. I can't believe how easy the recipe is. THANK YOU!THANK YOU! You Are the Soap-Queen! So glad I stumbled across your web-site and Youtube channel. Rob, Generally, all the coconut oil I've seen at health food stores is the typical 76 degree melt point. If it's not liquid at room temperature, it's probably not the same stuff that Sara is using. I think she's using a form of Fractionated Coconut Oil which is generally liquid but can harden up when very cool. That said, I could be wrong. There are lots of health food stores all over the US and I haven't checked each of them. LOL! You can use the same amount with Synergy Blends as the recipe calls for with fragrance oil. I bought my coconut oil from our local health food store. It was Organic Extra Virgin Olive Oil and I had great results. I used the whisk attachment for my hand mixer and the timing you used Anne-Marie was great! 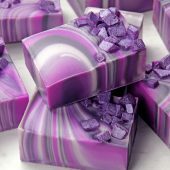 Anne-Marie, when using the synergy blends of essential oils from Brambleberry how much do I use in a recipe like this?? Virgin Coconut Oil is very different than 76 degree melt point Coconut Oil. So that might be it. But the other issue is that you're not supposed to melt the shea butter with this recipe. It's similar to creaming butter – you do both ingredients without heat. I was really excited to try such a simple recipe with the vigin coconut oil I sell…but so far I've had poor results. I bought my shea butter from Bramble Berry and it came in solid blocks. I melted 16oz of shea butter and added 7oz virgin coconut oil, 6ml vitamin E and 6ml fragrance oil. I am whipped with a hand mixer for about 5 mins. As the mixture cooled it quickly went from a whipped cream consistency to a solid again. Please help?! I hate to waste any more of my ingredients on experimenting. How should I prepare the shea butter when it is a soild? What about the virgin coconut oil (Which is also in soild form in these cold winter temps)? .095 ounces, or .1 ounces. You are correct. 2.66 without using the rounding for the grams or the 2.71 grams by using the full and correct gram measurement. Great job! Thanks for answering my question regarding the glycerin. Using this recipe (19oz) – am I correct in calculating the preservative at .5% as 2.71grams? So glad you're enjoying this recipe (yay!). It's a definite crowd pleaser. And yes, Energy is incredibly awesome (it's the #2 best seller at BB so you're in good company there). Vanilla + Coconut is a much lighter fragrance just in the bottle than something as bright and out there as Energy so that's probably why it's not as strong. You can use more for weaker fragrances. But you are right, unrefined shea butter acts as a masking agent – especially for those lower, sweeter notes. I don't know of a way to naturally reduce the smell of unrefined raw shea butter (besides refining it – which sort of defeats the purpose of using raw – LOL). You could just go with it and use darker fragrances like Patchouli, Amber, Sandalwood etc… and the unrefined shea butter would simply add to the darker, more masculine blend? Thank you so much for your help Anne-Marie! I made 3 batches this weekend and they came out great. Learning the fragrance part of it! So far my favorite is the Energy blend. 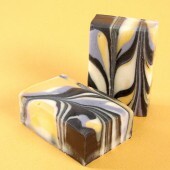 When I used the island coconut and vanilla it didn't seem to be as fragrant as I expected. I wonder if this has something to do with the fact of using unrefined raw shea butter. Do you know of a way to help reduce the natural smell of the unrefined raw shea butter to help make it more neutral without using refined shea butter?? 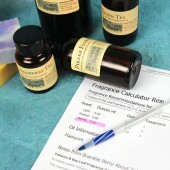 The fragrance calculator on Brambleberry has one for lotions but not butters. Can I use it for making this butter??? Krissy, Technically, if you added vegetable glycerin the product could grow mold in the glycerin so yes, Optiphen or Phenonip at .5% would be advised. Good question! I love this recipe! It's all I've been using for my face, hands and body for almost a year now. The only thing I add is some melted cocoa butter for a slight chocolatey scent. The cocoa butter is too hard at room temperature, but it whips in nicely when it's melted and doesn't harden the cream up at all. It stays soft and fluffy for weeks until it's gone! 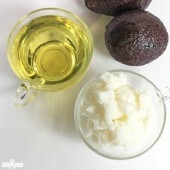 Thank you so much – I was so tired of melting and cooling and whipping shea butter – this is WAY easier and makes a better cream, in my opinion! I love this recipe and love how I don't have to add preservatives! I'm wondering if I add Veg Glycerin would I have to add a preservative? I agree – the melting/freezing thing can be one extra time-intensive step. The lumps were tinier Anne Marie. But I tried putting all the ingredients in the mixer together before whipping, rather than whipping the shea first and this helped. Plus, I whipped it longer. I am sooo glad I do not have to do all the melting/freezing anymore. Thank you so much for your help. Do the jars need to be double walled and does it matter if the lid is lined or not?? 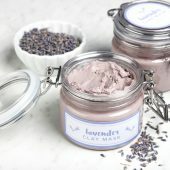 Does anyone have recommendations about packaging and a good resource for packaging body butters?? But if I was forced to get unrefined, I'd go with http://www.agbangakarite.com/ It does have a very strong smell so keep that in mind when scenting. I generally prefer to use refined shea butter. In the past when I have made candles and soap, it seems to get greasy on the outside. What would be the reason be for this? Wrong wax? Too much oil? The question I have is what source are you getting your unrefined shea butter?? There are quite a few out there. Thanks for chiming in. I've used Arrowroot and find it can work but my preference is Tapioca Powder. Tapioca Powder is vastly different than the product you are concerned with. The actual INCI name for Tapioca Starch Powder is Polymethylsilsesquioxane. In my personal opinion, the Skin Deep database should not be regarded as a complete source for information. They tend to rely heavily on Pub Med studies and place a great emphasis on in vitro studies. I use 5-8% arrowroot in my lotion bars and whipped shea butter. It reaches maximum oil absorption within 12-24 hours. Tapioca Powder is actually aluminum starch octenylsuccinate. When I create skin care formulations (which are purely for personal use), I try for the most natural ingredients possible as I have EXTREMELY reactive/sensitive skin. 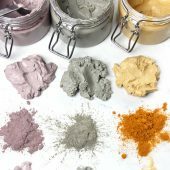 I double check my ingredients with the Skin Deep cosmetic safety database to see what research has been done on various ingredients (www.cosmeticsdatabase.com). 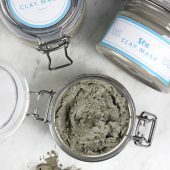 This site is what convinced me to take a more natural approach to caring for my skin in the first place after entering some of the ingredients in the products I was using. In case you're curious, aluminum starch octenylsuccinate by itself has a rating of 9 out of 10 as a health hazard. Of course, it really depends on how it is used in a formulation. OMG!!! I was looking for a whipped body butter recipe all night! I've come across a few that requires heating, cooling, etc., but thank goodness I kept searching and finding this on Anne-Marie's blog! Thanks so much! I've already got shea butter, which I ordered from you…smile. Can't wait to try this ummm tomorrow/today! Tapioca Starch Powder is modified Tapioca powder that has specifically been modified to be especially fine and free-flowing. Over Arrowroot, it will be a better final product using Tapioca Starch Powder (in my opinion). I don't recall anything negative on Arrowroot. There's plenty out there about Talc (which is mostly fear-based and not science-based) but nothing that I can recall off the top of my head about Arrowroot. Kyle, Are the tiny lumps hard hard little nubbins or just tiny lumps of un-whipped-in Shea butter? Thanks so much for the response! I'm hoping to use some of the stuff I already have, why do you suggest the Tapioca Starch Powder over the arrowroot? It appears like they're pretty similar? I remember awhile back seeing something negative about arrowroot I think on the BB site, but for the life of me I can't remember what it was! Liquid Coconut Oil (Fractionated) will produce a vastly different product. You shouldn't have to heat it up. Maybe just whip longer and at a more vigorous setting? Aubrey, I like to use Tapioca Starch Powder (https://www.brambleberry.com/Tapioca-Powder-P3803.aspx) rather than Arrowroot. It really makes it less oily and more smooth when applying. I would recommend 2 Tablespoons per pound of oils and add it and whip whip whip it in. You'll love it. 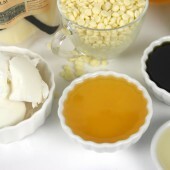 All my students always choose the Tapioca Starch Powder option over the plain oil one. Also – I see Breanna added arrowroot powder, which I have, but have never used. Is this to make it easier to apply? It did seem to take a little elbow grease to get it to spread out nicely and I would love any recommendation for an addition to the recipe to make it smoother. And how much arrowroot would Breanna or anyone else recommend adding to the recipe? Thank you again! hello! Not sure if this is getting replies anymore but I had a couple of questions. I had everything specifically except I used liquid coconut oil(fractionated), and I don't know if this might have made my outcome a little different. It seemed absolutely awesome, except I still have some tiny lumps of shea butter here and these(not grainy, just plain ole lumps) Any reason this could have happened? should I heat the coconut oil up a little before using it next time? Seemed plausible since it sounds like Anne-Marie started with solid coconut oil that she then turned into a liquid. 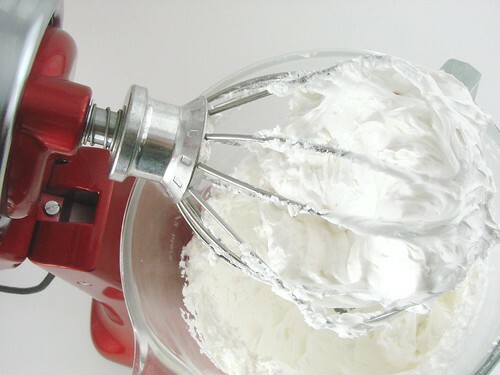 I used a handmixer, and wasn't sure whether to use the two beaters or one whisk. I ended up with the beaters. Or maybe I didn't work it long enough? I don't know, I just hate the lumps! Love, love, love this recipe. I have made several attempts at whipped shea butter in the past using the alternating-mixing-and-cooling method, and it always got harder after sitting. Plus it took forever. This was a snap, and it didn't feel greasy when I added arrowroot powder. Thanks! Trishnicol, not Anne-Marie, but would like to comment nevertheless. I had the same problem with every formula I tried, but that's just so great about this recipe: it soaks in so nicely. I've had great comments from the people who tried it. It's really a good recipe. You can always change the SWI lotion by decreasing the water by about 10-15% to make a much thicker body butter. That's the main difference between a body butter and a lotion – the water content. If you like a whipped body butter like this but don't like the greasy feel, try Tapioca Powder. It really helps cut down on that oily feel – a lot! I was just wondering if your whipped shea butter recipe is greasy-feeling. I have tried seems like hundreds, but probably only 8 recipes, but so far, they all feel greasy. Also wondering if you have a body butter recipe similar to your SWI lotion (I was there, remember? ), but thicker for a jar container. I'm glad you gave it a go and thanks for sharing your results! I started with room temperature shea butter and liquid coconut oil. Maybe give that a try…start with room temp mango butter and melted coconut oil. Mango butter can get a little grainy if it gets too hot. I usually temper it like chocolate. OMG. I can not believe you responded back. You are like a celebrity to me, so this is awesome and you made my day. I try it with the mango butter and I made a very tiny batch of 2oz of mango butter and .5 oz of coconut oil. When I put it together it came out really grainy. So I heated the oils in the microwave, blended them and put it in the frige till it became solid again, then I whipped it, and girl it came out like butter, like cream cheese icing. It still cold so I will see what it looks like at room temp. Mango butter doesn’t whip like Shea butter. The end resulted in a very hard consistency after a day. I usually make whipped Shea butter but figured mango was soft & the results should be great…Naah, not really. Thanks for the update, Tony! It’ll be good to know that we cannot whip Mango Butter like the Shea Butter. Can I use any other kind of butter like mango butter? And can this be done with a hand mixer? I just made this recipe but did not heat up the coconut oil before whipping it into the shea butter. Still turned out GREAT! My husband even took over the whipping process for several minutes as he could not believe how light and fluffy the mixture got after a few minutes. This is SUPER moisturizing so a little goes a long way. I think I actually heard my skin drinking up the moisture! What a wonderful and easy recipe Anne-Marie. Many thanks! Anon- Double Score! Sounds like you have a keeper for a husband. I love the glass bowl feature too. It's so nice to see what you're whipping up (especially fabulous shea butter). What a great reason to buy a KitchenAid Stand Mixer. Hubby bought the same model you have Anne-Marie, I LOVE IT! I have wanted one for the last few year. LOVE the glass bowl! The first thing I made was this "Easy Whipped Shea Butter". Turned out wonderfully!! Melissa, I had also way too much and I made a scrub with it. Just add sugar to your scented batch and some polysorbate if you think it will be too greasy to your liking. I's wonderful! And I bet it could be a nice 'bath butter' without the sugar. I did half a batch and I still ended up with waaaaaay too much! Is there something that I can do with this to turn some of it into something else? Could I use it in soap somehow? Turn it into a bath oil, or regular lotion, anything? I do like it on my driest of areas, but not so much as a hand lotion so I can't imagine going through this much!! Thanks! I did regular coconut oil which seemed to help maintain the fluffiness longer than when I've used liquid oils in the past. Did you use fractionated coconut oil? I was wondering if regular CO would make a hard whipped butter in cooler temps? I used regular, melt point 76 degree coconut oil, that is solid at room temperature. No problems with the Shea Butter turning grainy without melting it? Did you use Fractionated Coconut OIL or Extra Virgin Coconut Oil? I love whipped shea butter and wouldn't have thought it was so easy but I gotta admit, I'm cringing a little at the thought of using that beautiful, limited edition Kitchenaid NOT for delicious (edible) treats! I made this today and it is awesome, so nice and light. I have previously been using recipes that have different oil/butter ingredients along with the shea, and always had to heat up/cold water bath/whip several times to get it fluffy. This recipe is so much easier. For fragrance I used bergamot, grapefruit, and orange essential oils blend, and also added contents of 3 natural vitamin E capsules. Filled 8 4 oz jars, with tester left over. Thanks so much for the recipe. I was searching for a good whipped shea butter recipe for ages (it always turned out too hard, too soft, too greasy, too oily…) and, wow, I think I found it now! I made it a few days ago and it's still creamy and fluffy. Feels wonderful on the skin. Sinks in very quickly. Also made a salty spa fragranced sea salt scrub with it that turned out very nice; rather greasy (look out: very slippery floor! ), but after drying it leaves just the right amount of oils on the skin. I think you could easily add some polysorbate if you prefer it less greasy. Thank you so much, Anne Marie,for this awesome and unbelievable simple recipe! Greetings from The Netherlands! Anon, You could definitely add sugar or salt to the recipe and fold it in (like flour or sugar to a frosting or cake mix). The product will be thick and very creamy luxuruious. This would be great for the winter. Looking forward to trying this. Thank you!! I've been looking for a whipped sugar scrub recipe for some time…something firmer than the typical sugar scrubs- what do you think about adding some sugar to it? I can't wait to try this. I've been experimenting with lotions lately and I like that this recipe leaves the water out. Thanks for sharing! Hi Marmotte! Anne-Marie is off to Saudi Arabia today. I know that she melted the Coconut Oil first and used the Shea Butter at room temperature. Good luck with the recipe! what a great recipe, thank you so much! do I need to heat the oils in advance, or should I use them at room temperature?? I already made it and you guys are going to love it!!! Its great on dry skin and with the fragrance I put in its wonderful! 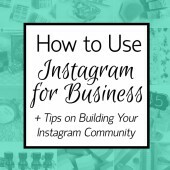 Anne Marie thank you so much for such an easy and wonderful item!!! I love it and can't wait for my daughter to try it!!! Thank you! can you cut this receipe in half? I think it does look more like cream. Its great looking and I can't wait to make it!!! I just need to make a little less than 4 jars. Thanks so much for posting this. This is great! Pamela, You could easily whip in a mica to the mixture or any oil soluble (skinsafe) colorant. Ann- It's still soft and buttery. The way it feels right now (I made the first batch a few weeks ago),I don't think it's going to harden up at all. A.J.- I measured the shea butter and coconut oil by weight. Nice job and thank you for sharing all this fun! Is there an additive necessary to keep it in this form and fix it, or will it stay all on it's own all fluffy and poofy? Can a faint color be added, say seafoam green or some such? Thanks Anne Marie so much. Now you've got me itching to try this too! You make everything seem so fun and easy. I LOVE your red Kitchenaid mixer, BTW! what would you call this? Is it whipped body butter or just cream? Do you think Babassu oil would work as well as coconut? This looks so easy, I can't wait to try it. BTW When working with Shea butter do you measure by weight? or do you measure it like brown sugar and pack it into a measuring cup? good question, does it turn hard after a while! sound great and looks even better! Easier than the whipped body butter that I have been making! thanks so much for this…been meaning to make some for ages..and now I know how simple it is, i'm off to the kitchen! Does this go hard after 24 hours, or does it stay nice and rub-innable? Thanks! I have been making and selling a very similar recipe that I stumbled upon in my experimenting. Aren't these just the best kinds? Lol. At any rate, it is a very easy recipe, and one that extends your shea butter nicely, so thank you for sharing! Love anything simple that turns out great! Can you use other oils besides the coconut? This is wonderful! I've been holding on to some shea butter that got "smell-ified" by leaking lemongrass and this was the perfect project for it! I made a small batch using a whisk, warmed the coconut oil up a bit and it blended super easy by hand. Added a smidge more lemongrass, glopped it into a little ziplock storage jar and presented it to my sweetie for his cracking hands. Now he thinks I'm the best. Thanks Anne Marie! After that cupcake post, this looks delicious! Great idea and fun experiment. Princess Frances, The Cocoa Butter won't work because it has a harder consistency than the Coconut Oil so the product won't whip quite the same way. Refined versus unrefined should not make a difference in the shea butters. Kelly, You do not need a preservative since there is no water in the product. An anti-oxidant like Vitamin EO or ROE or GSE to help prevent spoilage (oils going rancid) would be lovely but you don't need any sort of synthetic preservative. do we need to use preservatives? i came across a site on etsy that said so….but i thought you only had to add preservatives when there was WATER in the mix. i am so glad you posted this and i know you are going to saudi and all but this detail has really been weighing on my mind. 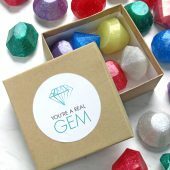 making and selling this fab product! Does it matter if you're using refined or natural shea butter? If it does is there any prep to either of them? I have been wanting to try whipped shea butter for a while now but I only unrefined shea butter, not sure it will be as nice. What an awesome idea! This will be great for those horrible Wisconsin winters! Could I use cocoa butter instead of Shea?